Devbagh beach is next beach to Tarkarli beach and ends at “Devbagh sangam”. Devbagh sangam is a confluence of the Karli River flowing into the Arabian Sea. This point marks the southern most tip of the Malvan taluka. This long beach lures to the tourists by its stunning white sand and crystal clean beautiful blue water lagoon, thus an idealist spot for swimming, sunbathing and picnicking. Flock of local sea birds known as ‘Sea eagles’ add to the beauty of serene surroundings by playing with the sea waters. A hill in the back drop offers panoramic view of Arabian sea. Sunset is the peak time to watch this nature expression. 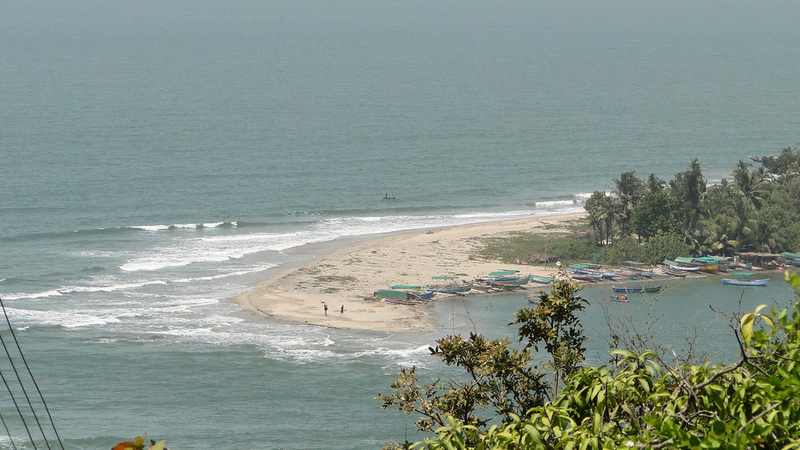 Mingles secretly with sea waters from behind Devbagh’s famous confluence also known as a local word ‘Mobar Point’. Local fishermen recently started water sports near confluence at Tsunami Island. They have water scooter, jet ski, bumper ride, banana/dolphin boat ride, Kayak boating sports and para-sailing. Devbagh beach is not so crowded even during peak season and its beauties attracts tourist looking for peace and nature. Some good hotels, resorts in Devbagh are also available for stay with family. Some local villagers are also renovated their homes for tourists to stay with them as a paying guest, one can enjoy local life and food with them. Tsunami island of Devbagh and confluence of karli river offers a mesmerizing experience for all beach lovers. Building sand castles, collecting colourful seashells, chasing crabs in the sands and wading into the sea.